With its rich soil, rolling hills and temperate climate, northern California has given rise to extraordinary winemakers, organic farmers, ranchers and stellar artisan cheesemakers. In many cases, this abundance extends beyond the boutique groceries of the region to find a welcome place on shelves in metropolitan areas across the nation. But many of our region’s wonderful products do not travel to the far reaches of our world and I fully realize how very lucky I am to have this incredible wealth of talent and dedication available to me just steps away in my neighborhood. One such local producer is Soyoung Scanlan, cheesemaker extraordinaire of Andante Dairy. I met Soyoung while I was working in the pastry kitchen of a fine dining restaurant a few years ago. She was our cheesemonger and I had the great fortune of being on the receiving end of her finely crafted delectable cheese. She crafts only small batches and every piece is exquisite. Her care and close attention to production and affinage are evident in every bite. Also an accomplished musician, Soyoung names each of her cheeses in keeping with her musical inclinations. 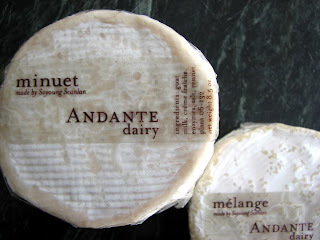 If you live in the Bay Area or are ever in the region, please take the time to seek out Andante cheese. Although most of her cheeses go to the region’s finest restaurants, the French Laundry among them, they are available at the Saturday San Francisco Farmer’s Market and at our local Whole Foods. 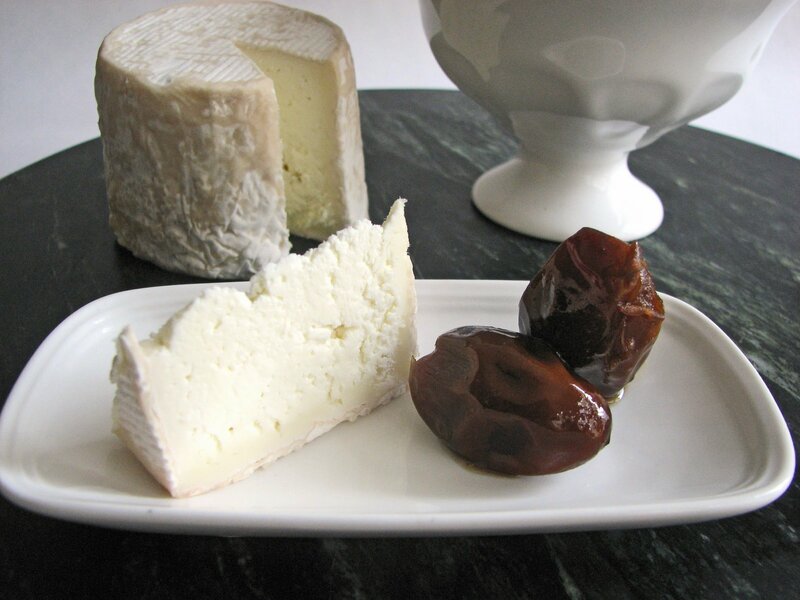 In contrast to the region's emerging artisans, I pair Soyoung’s amazing cheese with one of the world’s oldest gifts from nature, Medjool dates. Dating back to 5th Century Egypt, dates were transported by the Moors to Spain and thrived throughout the Middle East and the Mediterranean. Medjool plantings originating from Morocco and Jordan are now cultivated in the Coachella Valley of California. Medjools are considered the largest, plumpest and most prized of all the varieties and should be readily available in your area. Andante’s Minuet is a soft-ripened goat’s milk triple crème made by adding crème fraîche to the curds. Mélange is a fabulous blend of goat’s milk and cow’s milk that results in a beautiful tanginess and richness made in the style of the best brie. It has a light luscious texture combined with a nice acidic bite, which pairs perfectly with all of the wonderful elements found in a recipe for Roasted Dates with Sherry and Spices from The Last Course by Claudia Fleming. It’s an astonishing combination of old world and new world that will leave you happy for having found these abundant pleasures. 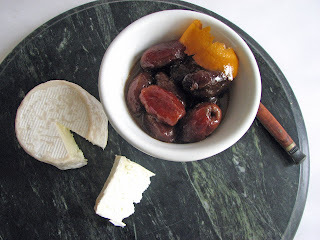 If you are unable to locate Andante cheese to serve with these dates, there are so very many other great choices. I would recommend just about anything, from a tangy goat to a gooey brie, a nutty gruyere, a tomme or a grand Parmigiano Reggiano. And of course there’s always ice cream: vanilla, chocolate, caramel, coffee or perhaps a fruit sorbet such as orange or mango, to name a few. - I used a Lustau Amontillado Los Arcos Sherry. I also think a Rainwater Madeira, with its caramel, orange and hazelnut notes, might work very well in place of the sherry. Preheat oven to 350 degrees. 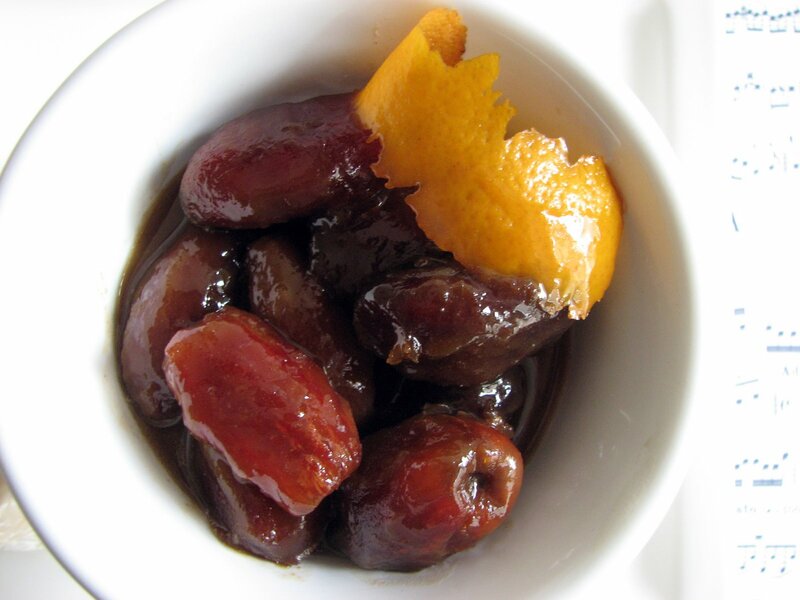 Place dates, sherry, brown sugar, spices, orange peel and water in a saucepan. Bring to a simmer to dissolve and blend ingredients. Pour in a shallow baking dish and bake @ 350 degrees for 15 minutes, basting every 5 minutes. Remove the dates from the syrup. Cool and remove skins if you prefer. Strain the syrup back into the saucepan and discard spices. Bring syrup to a simmer and reduce by a third, about 7 minutes. Whisk in butter until the sauce is completely emulsified. Pour over dates and serve. ‘Tis the season for nut recipes. The holidays always come with plenty of festive nut-filled cookies, cakes, tarts and tortes that feature almonds, hazelnuts, pistachios, pine nuts or walnuts. Spices, dried fruits and booze also figure prominently in our holiday pastries. The first nut dessert of the season's line-up is one I adapted from In the Sweet Kitchen by Regan Daley. She offers a Walnut Layer Cake with Coffee Buttercream, but I wanted something lighter and more in keeping with the season. So I halved the recipe to produce just one layer, added a pinch of orange zest and decided to plate it with some sautéed apples and a caramel sauce to really give it the full autumn treatment. 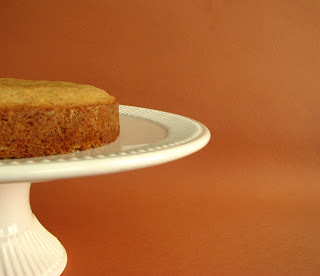 The cake has a warm walnut flavor, is buttery moist and has just the right crumb. When combined with fruit and a hint of citrus, this composition brings some of the best winter flavors into full bloom. This recipe is a perfect match for many, many different flavors. 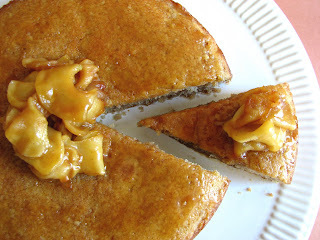 You can add a bit of brandy to the cake or some spices to the caramel. You can sauté the apples with some rosemary sugar. You can add a bit of espresso or orange juice to the caramel or you can omit the caramel and serve with caramel ice cream. Or make a ginger orange syrup. Omit the apples and the caramel and serve with coffee ice cream. You can substitute bananas for the apples. Or some variation on all of the above. You get the picture! Experiment with your favorite combinations. - This is more of a cake than a dense walnut torte, which is also on my list of projects. - As always with caramel, give it your undivided attention. It will turn on you in a second! Try to take it to a deep amber color to avoid it being too sweet. Take it off the heat the moment it reaches the right color and add the other ingredients to stop the cooking. And remember, whenever you add an ingredient to hot caramel, it’s going to bubble viciously. Just stand back and let it unwind. Also, be sure the cream and butter are at room temperature. Adding cold ingredients to hot caramel will likely cause it to seize on you. To fix a seized caramel, place it on low heat and whisk gently until dissolved. - The ratios for the butter and cream in the caramel can be adjusted to your own taste, as well as the salt. I prefer a salty caramel! - If you fear the caramel, you can make a simple sauce by bringing 1 C of brown sugar and 1/3 C water to a boil. Add 2 T butter and 2 T heavy cream and whisk to combine. Stir in 1 T cider vinegar to finish the sauce. The amount of butter, cream and cider vinegar can all be adjusted to suit your own personal preferences. - I always grind nuts with a bit of sugar from the recipe to avoid releasing the oils and producing a nut paste. 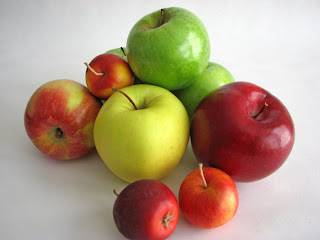 - Use your favorite apple of the season that will hold up to cooking. I like the tartness of Granny Smith. Preheat the oven to 350 degrees. Brush an 8-inch cake pan with butter and line the bottom with a parchment round. Butter the parchment and dust the bottom and sides with flour. Place the walnuts in a food processor with the 2T and 2t of sugar. Process until the nuts are finely ground and resemble bread crumbs. Be sure to stop if the mixture looks like it’s starting to clump. Sift flour, baking powder and salt. Beat the butter until smooth. Add the 1/2 C sugar and orange zest. Cream the mixture on medium speed until pale, light and very fluffy, about 4 to 5 minutes. Add eggs one at a time, mixing thoroughly before adding the next and scraping down the bowl after each addition. Add maple syrup and vanilla. Blend in ground walnuts. Using a large rubber spatula, fold in the flour by hand in three batches, mixing just enough to moisten and blend. The batter will be quite thick. Scrape into the prepared cake pan and smooth out the top. Bake in the center of the oven for about 28 minutes or until a toothpick comes out clean. Cool on a wire rack for 10 minutes. Run a thin blade knife around the cake to loosen and invert. Flip the cake back over to right side up and cool completely. Place 1/4 C water, sugar and corn syrup in a saucepan and turn up the heat. Cook the sugar mixture until it turns an amber color, about 7 minutes. Watch closely. Once the sugar starts to color it accelerates very quickly and will darken to a burnt and bitter stage very fast. If it's not coloring evenly, swirl the pan just a bit to circulate. Once it has reached the right color, take it off the heat and slowly add the cream. It will bubble up vigorously. Once it subsides a bit, add the butter and whisk until thoroughly combined. If there are any seized bits of caramel, return to low heat and stir continuously until dissolved. Stir in the scraped vanilla seeds or vanilla extract and salt to taste. Set aside. Peel, core and slice apples into thin wedges. Melt 1 T butter in large skillet over medium-high heat. Add apples; sprinkle with 1 T sugar. Sauté apples, shaking the pan to toss, until almost tender and beginning to brown, about 5 minutes. Sprinkle with remaining 2 T sugar and continue to cook and toss until sugar melts and apples are caramelized. Set aside. 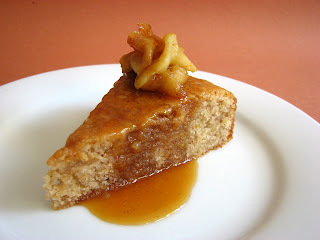 Lightly brush the top and sides of the cake with the caramel sauce. 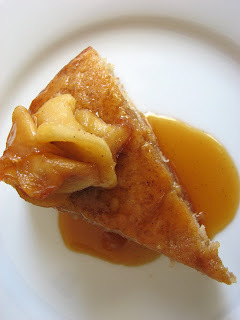 Plate a piece of the cake and top with apple slices and drizzle with sauce. The annual promotion of Beaujolais Nouveau, which occurs on the third Thursday in November, is a longstanding French ritual to celebrate the end of the first harvest of the Gamay Noir grape. Beaujolais Nouveau is the product of a brief whole grape fermentation, which produces fruitiness without extracting the bitter tannins from the grape skins. The wine is ready for consumption in just 6-8 weeks. French wine merchant Georges Duboeuf is responsible for creating this promotional event that begins with a rush to deliver the first bottles of the new vintage to Paris. By the 1970's it became a national event and in successive decades spread to the rest of Europe, then North America and eventually to Asia. In the United States, it coincides with the Thanksgiving holiday. The wine is often served chilled and is considered a very lightweight drink marketed for immediate consumption rather than aging. 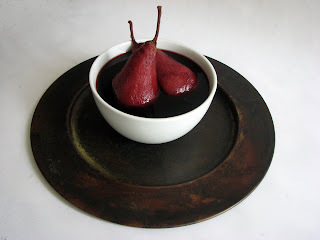 As the celebration rolls out this weekend, I am reminded of how good a simple dessert of wine poached pears can be. Perfect at the end of a heavy fall meal, the following recipe is adapted from the prolific Patricia Wells, the sole American ever to become a restaurant critic in France. The recipe was brought to my attention on Chowhound’s Home Cooking message board. What caught my eye was the description, which revealed that the poster couldn’t stop eating these pears and wound up licking her bowl. So I was inspired by such unbridled glee to try this recipe and sure enough, this sauce will leave you helpless. 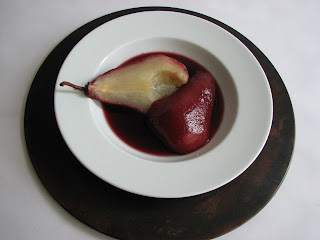 Lovely pears poached to perfection in a sauce that blends a wonderful fruitiness with a subtle sweetness and haunting blend of spice. You, too, will surrender before too long. 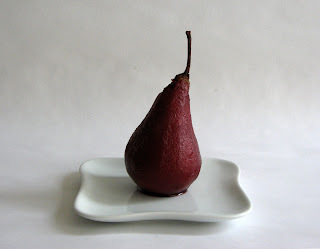 - Use an ordinary vegetable peeler to peel the pears, following the vertical contours of the fruit and being careful not to bruise as the red wine tends to emphasize the surface during the poaching process. - If the pears are not completely submerged in the wine, turn them as necessary every 10 minutes to ensure even saturation and coloration. - I used a good quality zinfandel with terrific results. 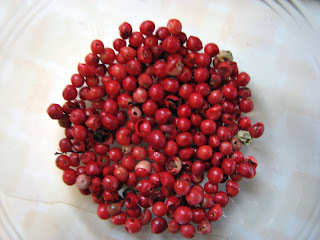 - I highly recommend Malabar peppercorns, native to the Malabar Coast of India and the island of Sri Lanka and the best of the mass-produced variety. - Crème de cassis is a wonderful liqueur made from black currants in the Burgundy region of France. I used a bottle from Chermette. The liqueur lends a bit of sweetness and a rich depth to the sauce. Crème de Casis was originally produced by 16th century monks as a cure for disease and wretchedness. Incidentally, it is the favorite drink of Agatha Christie’s fictional detective, Hercule Poirot. Carefully peel pears. Combine remaining ingredients in a saucepan and bring to a simmer. Submerge pears and simmer on low heat for about 30 minutes. If the liquid doesn't totally cover the pears, turn them every 10 minutes. Cool and refrigerate 24 hours. Serve at room temperature. It hardly seems like fall until the sweet aroma of apples baking in a hot oven wafts through the neighborhood. There’s something about the sensory combination of a crisp breeze, a dust up of autumn leaves and the sight and smell of a warm apple dessert that quintessentially inaugurates the arrival of autumn. Whether it’s a quickly devised apple crisp, an old-fashioned apple pie, classic French apple tart, Austrian strudel or European apple cake, apple desserts are among the most ubiquitous and satisfying pleasures in just about every region of the world. They are the reliably delicious staple that gets us through these long winter months before spring arrives with its grand palette of fresh color and succulent sunshine flavors. When the kitchen is full of the fragrance of apples baking, we know we are in for supreme comfort. 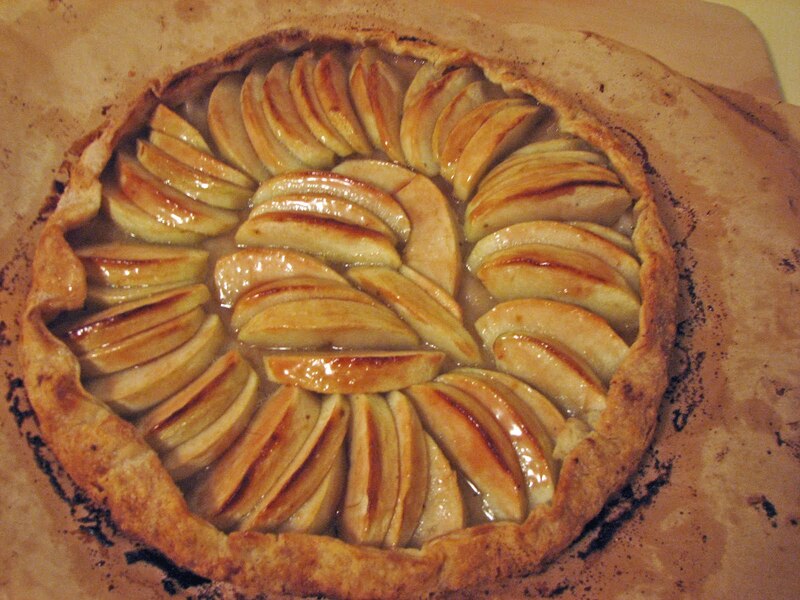 I love baking all the traditional apple desserts, but today I’m thinking about a free form apple galette that delivers a slight herbal note to pique our interest and remind us that a tiny bit of savory is more than welcome in the apple kingdom. The smell of a fresh rosemary sprig can lift our spirits just by merely showing up. One bite of this dessert and you’ll see what I mean. Tender apples, just a slight hint of fresh herb and a pinch of sweetness, this is a truly satisfying celebration of fall. - This recipe calls for a bit of rosemary sugar that is made by simply grinding fresh rosemary and sugar together to get a fragrant blend. Use a clean coffee grinder that is used for spices only or your food processor. Although only about a tablespoon or so is needed, to get a good blend you’ll need to do a slightly larger batch. The remainder can be used on toast or mixed into hot oatmeal or a good pound cake recipe. 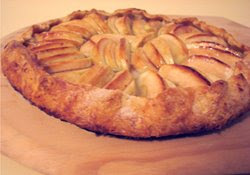 - This dough recipe makes enough for two galettes. You can freeze half the dough for later use if you’d like. - I used Fuji apples but choose your favorite baking variety. Keep in mind that sugar levels vary greatly in fruit, so always taste the fruit to gauge the desired level of sweetness. You’ll often see that my recipes include the phrase “to taste” to accommodate personal preferences. So taste, taste, taste. To prepare galette dough, whisk the flour, sugar and salt in a bowl to combine. Cut the butter into the flour mixture until you have mostly small pieces the size of tiny peas and some just a bit larger. You can use your fingers to do this or a pastry blender works well. Be sure each piece of butter is coated with flour. Add the cold water and mix gently with your fingers until the dough just starts to come together. Gather the dough on a work surface. Use a pastry scraper or metal spatula to fold the dough back onto itself and gently pat down with your hands into a loose disc. Repeat this process again once or twice until the dough looks like it’s coming together. Place the dough on a piece of plastic wrap. Gather tightly and chill thoroughly, preferably overnight. When you are ready to roll out the dough, remove from the refrigerator and rest on a lightly floured board for a few minutes so it can soften just a bit to prevent cracking. Then roll the dough out to a 14” circle about 1/8”thick, moving the dough after each roll and keeping the board lightly floured as needed. 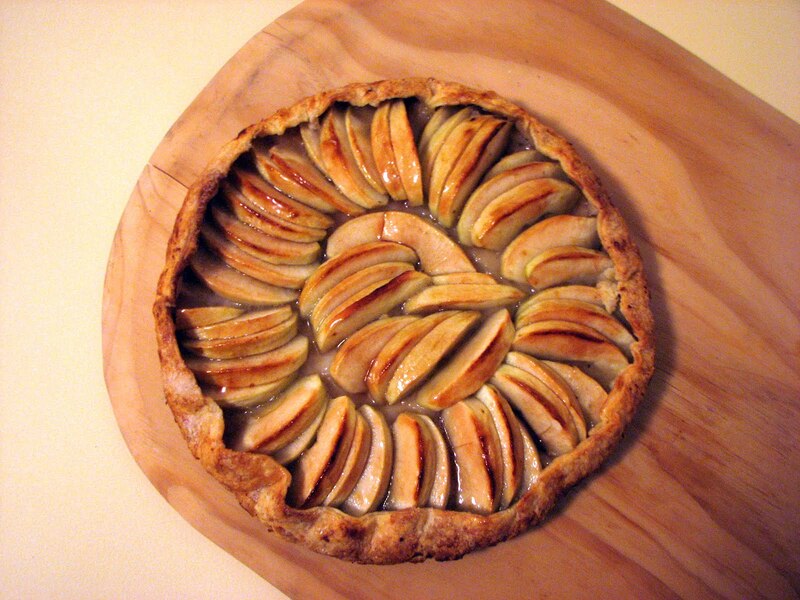 When you have the desired shape, lift the pastry onto a parchment covered pizza pan or baking sheet. Chill for about a half hour. Prepare rosemary sugar by grinding about 15 coarsely chopped rosemary leaves and about 3 T granulated sugar together in a clean spice grinder or a food processor. The rosemary should be as finely ground as possible. Set aside. Squeeze juice of half a lemon into a large bowl. Peel, core and slice apples into thin wedges. Toss in lemon juice and sprinkle with 2 T of plain sugar. Toss thoroughly to coat all the apple slices. Remove prepared galette dough from the refrigerator and sprinkle 1 1/2 T rosemary sugar evenly across the bottom, leaving about a 1 1/2” border all the way around. Arrange sliced apples on top of rosemary sugar as you wish. Now start to lift and gather the dough up and on top of the fruit, being careful not to create any cracks. Work with both hands, pressing gently to keep the dough in place. Chill for one hour. Preheat the oven to 400 degrees. Brush the border of dough and the fruit with melted butter and dust the dough and the fruit with a generous sprinkle of plain sugar. Bake for about 40 – 50 minutes, until the dough is crisp and browned. Cool on a wire rack to keep the bottom of the galette crisp. Fresh unadorned pineapple is a juicy treat all on its own, but there are some very simple ways to embellish the tropical deliciousness of this fruit. Browsing through some of my cookbooks the other day, I refreshed my acquaintance with The Last Course by Claudia Fleming, who enjoyed quite a run as Pastry Chef at Gramercy Tavern. And I know it’s November, but reading through her prescription for roasted pineapple, with its glorious floral notes, warmed me up considerably. Roasting this acidic fruit brings out the tenderness of each slice. Bathing it in a caramel sauce redolent of herbs, spice, rum, and a fresh vanilla bean really takes this dessert into the realm of a languorous lazy day on a fantasy tropical island. So join me in this flight of fancy. I highly recommend you hang up your raincoat and set sail for the nearest pineapple grove. And please! Don’t forget to send a post card. - One very important note: the recipe starts with making a caramel. It gives good instructions for cooking the sugar, but whenever you make caramel you must always include a way to stop the cooking process or it will likely burn. In general, this means either adding a liquid to cool it down or immediately placing the pan in cool water to stop the cooking. Fleming’s recipe simply says to add the pineapple once the caramel reaches the appropriate color, but this alone may not stop it. So be sure to have another pan with an inch or so of cold water in your sink so you can take the pan off the heat and place it in a cold water bath if necessary to immediately stop the caramel from burning. It will hiss and bubble, but just stand back and let it unwind. The other thing you can do is quickly and carefully pour the caramel into another metal bowl and place the bowl in the cold water. Don’t worry if the caramel seizes a bit. It will quickly melt once it goes into the oven. - Remember, burns from hot caramel are very painful, so be extremely careful about handing the pan. 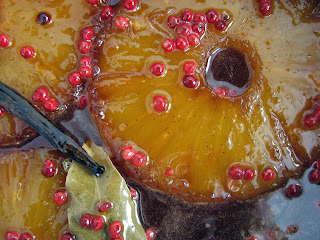 Add the pineapple slices slowly and carefully so they don’t splash hot caramel your way. - Fleming says to use a 10” oven proof skillet for 8 slices of pineapple, but I could only fit 3. You’ll need to use a roasting pan large enough to fit 8 slices and then pour the caramel sauce over all, basting every ten minutes. - The bay leaf, vanilla bean and pink peppercorns are what lift this dessert to utter greatness. Don’t leave them out! And be generous with the salt, tasting as you go to see how salt can really improve a dessert. - The most commonly available vanilla beans are Madagascar (sometimes called Bourbon) and Tahitian. Both are wonderful, but if you can get Tahitian, they are the most floral and aromatic and the favorite found in fine dining pastry kitchens. - This dessert is stupendous on its own, but I can see you’re already thinking about vanilla ice cream, so follow your bliss. As for me, I think this might make an interesting element in a dessert cheese course and would be really delicious with a good Manchego or an aged goat cheese like the Spanish jewel, Garrotxa. - Leftovers will keep for several days and can be gently reheated. I’m already starting to think about ways I can replicate this stupendous sauce in other desserts…………yes, I will. Heat 1/4 C water in a 10” skillet. Add sugar and corn syrup and turn up the heat. Cook the sugar mixture, swirling occasionally, until it turns to an amber color, about 7 minutes. Watch carefully. Once sugar starts to color it accelerates very quickly and will darken to a burnt and bitter stage very fast. Be sure to take it off the heat before it gets to a dark amber stage. Once it has reached the right color and before it starts to smoke, quickly place the caramel pan in another pan that has about an inch of cold water to stop the cooking. Carefully add a couple of pineapple slices using tongs or a long-handled fork to slow the cooking further. Stand back as it sputters. Once it has subsided and stopped steaming, carefully lift the pan out of the water bath. Stir and add vanilla pulp, vanilla pod and bay leaf. Place all the pineapple slices in a roasting pan and pour the sauce over all, coating each slice. Bake about 40 minutes until pineapple is tender and translucent, basting every 10 minutes or so and turning slices to coat as necessary. Remove pineapple to a platter and cover to keep warm. Add the butter, rum, pink peppercorns and salt to the hot caramel sauce and whisk until smooth. Spoon over pineapple and serve. Prepare for total pleasure overdrive.